Heat oven to 400°F. Line 15x10x1-inch baking pan with foil; spray foil with nonstick cooking spray. Cut eggplant in half lengthwise; place cut side down in foil-lined pan. Bake at 400°F. for 45 minutes or until eggplant is soft to the touch. Remove from oven; cool 5 minutes. Scoop eggplant flesh from skin into food processor bowl with metal blade. Add tomato, onion and garlic; process with on/off pulses until pureed. Add tahini, lemon juice and salt; process until smooth. Spoon dip into serving bowl. Sprinkle with parsley. Serve with cut-up fresh vegetables or as spread with toasted pita bread wedges, sliced French bread or crackers. 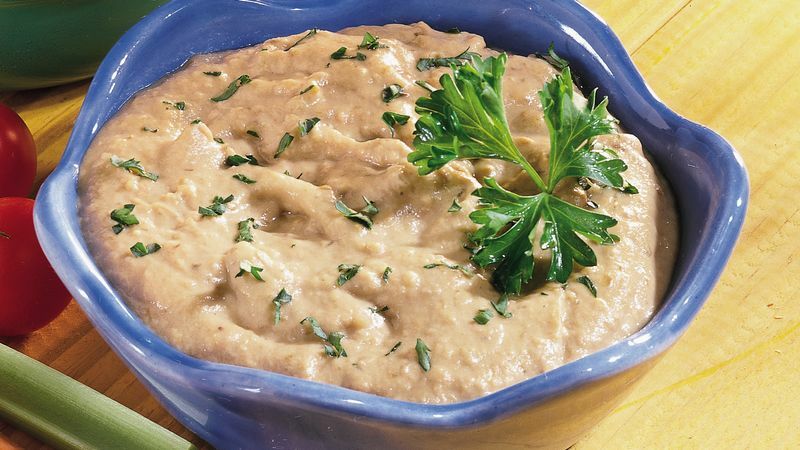 This recipe resembles baba ghanoush, a Middle Eastern eggplant spread. Our recipe features the non-traditional addition of tomatoes and onions. Like tomatoes and potatoes, eggplant, is a member of the night-shade family. Eggplant grows in a variety of shapes and sizes, from large pear-shapes to slender zucchini-shapes. Its color ranges from white to purple to striped. Purchase firm, unblemished eggplant without any soft areas.